Alien Explorations: Jack Kirby references Giger's Landscape XXIX (1974) (work 249) in The Eternals #7, January 1977 ? The Eternals #7, January 1977 ? 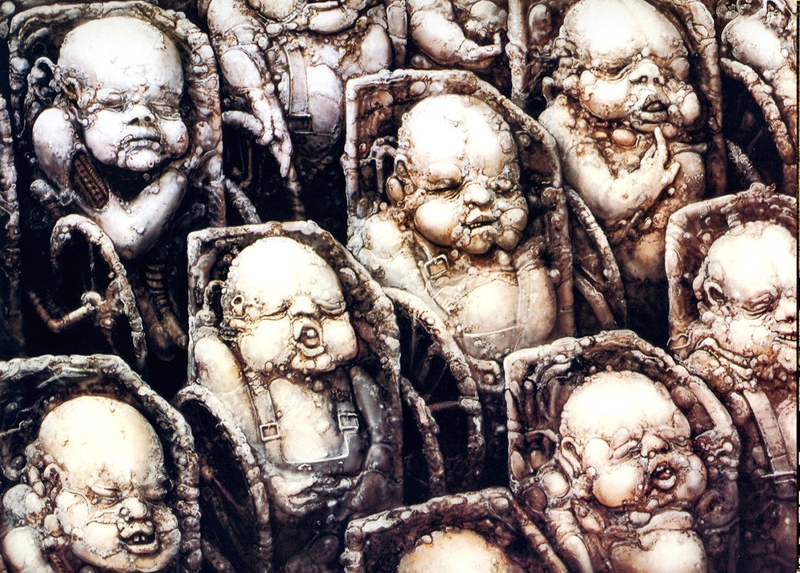 A question about whether Jack Kirby took HR Giger's Landscape XXIX featuring babies on wheelchairs, and reinterpreted it to make the faces in to the heads of the Celestial giants from #7 of The Eternals. It seems to be a suggestion that Kirby found out about Giger's art, he himself was interested in art and surrealism, and Giger had already been referencing his art back in paintings such as The Spell II, III & IV. Again there isn't much to go by but some of the details vaguely or abstractly conform to one another and it's all up in the air. The arm of the baby has lost flesh on the upper arm and ribbed metal is seen beneath. It becomes transformed into the head set and mouth of the Celestial giant named Jemiah The Analyzer, and where there is a gap in the flesh, there is a gap between the head set and the mouth. Here the blobs over the baby's left eye seem to resemble the flower bud shaped blobs on the left side of the face of this celestial. This baby appears to have diagonal impressions around the brow and Kirby has created diagonal patterns for the unnamed Celestial. Added Jack Kirby references Giger's Landscape XXIX (1974) (work 249) in The Eternals #7, January 1977 ? So it might well be that Jack Kirby was somehow aware of Giger's work, not really sure how. In issue 7 of the Eternals, there's a panel showing the rows of Celestials, and it looks to me as if he had take Giger's landscape showing the babies in wheelchairs and abstractly used them as reference for the faces of some of his Eternals. So certain faces correspond to the babies in their positions in the images. So perhaps they had friends in the artworld, although Jack Kirby was known for drawing precognitive comic book stories, and then it seems to be just me making the association in my usual way. I'll try not to wear myself out any more thinking about it.